LITTLE ROCK, AR- Governor Mike Beebe, Senator Robert Thompson, and Department of Rural Services Director John Andrews presented $244,000.00 to 14 rural communities selected for Fiscal Year 2014 Cycle 1 funding through the Arkansas General Improvement Funds Grant Program at an awards ceremony on January 10, 2014 held at the Paragould Chamber of Commerce. 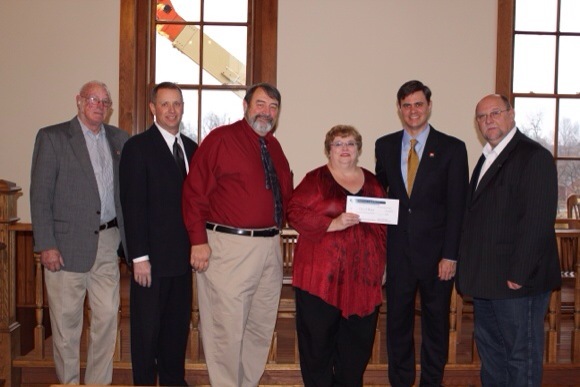 In attendance were representatives receiving an Arkansas General Improvement Fund Grant award on behalf of Hoxie in Lawrence County. The City of Hoxie received $12,500 to make renovations to the Hoxie Service Center. The Department of Rural Services works in partnership with the Arkansas Rural Development Commission to administer the Arkansas General Improvement Funds Grant Program. Incorporated cities and towns and unincorporated communities in rural areas of less than 20,000 in population are eligible to apply for assistance through the mayor or county judge’s office. For more information about the Department of Rural Services and their grant programs contact Rural Services at 1-888-RURAL-AR.